Positive effect on vascular physiology. Protects against dementia and Alzheimer’s disease. A number of clinical studies show a rapid and significant improvement in symptoms of depression following a few weeks' EPA supplementation including among patients who have failed to respond to conventional treatments. A Harvard study on women with unstable, difficult mood swings found that after 8 weeks' supplementation, they experienced a significant improvement in mood, and were much less aggressive and more sociable. Other ingredients: vitamin E (alpha-tocopherol). 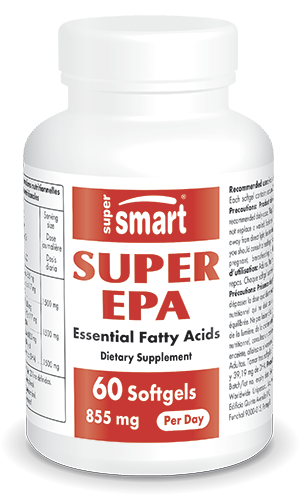 Each softgel contains around 285 mg EPA and 39.19 mg of DHA. Warning: Product derived from fish. Take three softgels a day at mealtimes, or as advised by your therapist. Continue with this dose for three months, and then adjust according to results obtained.